Rob Murray knows you're going to compare Real Racing 3 to the Gran Turismos and Forza Motorsports of the world. 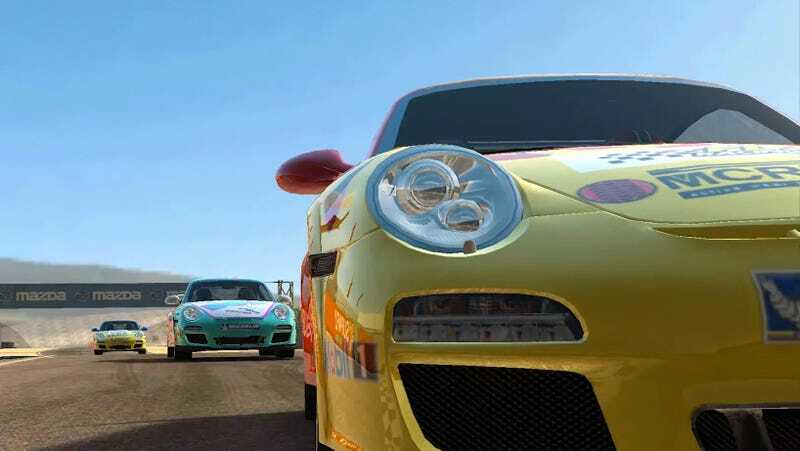 Those PlayStation and Xbox franchises stand as the two best exemplars of a certain kind of authentic racing experience on consoles. Their fans want to replicate being inside a car as much as possible. They get the racing wheels and the pedals and build special bespoke chassis that let them sit right in front of a screen. And then there's the Real Racing games where you steer by tilting a phone. Murray isn't worried about the difference in scale when you compare RR3 to console and PC racing titles, though. "I think we can really expand what the genre is." He said when I spoke to him last week. "Everyone loves cars. Everyone's got one, right?" And they're all different, Murray expounded. "Not everyone drives a Hummer or a Porsche, even if they're lucky enough to own more than one kind of car. They're interested in interacting in different ways. I think there's room to expand what this genre is and what it means to people." What Murray's team have been getting at is making a game that's digestible in short sessions like an Angry Birds or a Fruit Ninja but one that looks as good as an Xbox 360 title. The challenge is implementing it on a device with no buttons, no pedals, no stick or steering wheels. "You think about the great TV series, the HBO dramas and stuff. They represent, in some entertaining way, some facet of life that fascinates us, whether it's the Sopranos and the Mob or Boardwalk Empire or something like that," Murray began. Those things already go through a filter. "It's a dramatization. And there's such an art to that. And when the drama is great, it feels authentic. You get immersed and that's when you're saying, "This is real." Players have been trained to think in abstract terms by console driving games, Murray told me, and the input methods they're used to are actually quite removed from the car. "They move through their thumbs. It's different but they have a great time," he said. But Murray thinks tilting an iPhone feels more like turning a steering wheel. "I've seen those set-up and most people just can't drive in them. They can't drive like that. They're not getting the feeling for the track. So even though those [elaborate racing set-ups and the games] go so far, they're falling way short. And when people try and develop very authentic things, like for driver training and stuff, but I don't think it actually necessarily creates a real racing experience. I think a great interpretation or dramatization, that is what creates a real racing experience." He's biased, of course, but Murray think that there's genuine, bite-sized drama in Real Racing 3, even if it runs on a mobile phone.